The govt released it's intelligence hacking report about Russian interference with the election. A lot of reasons and strong arguments are made for sure but to be clear this cyber war has been going on for years. Why is it this admin did nothing for approx 10 years? Kellyanne Conway nailed it by pointing out almost every govt agency was attacked but no concern or action was taking leading into 2016 election because the White House, Hillary and DNC thought she would win. Also the DNC REFUSED to allow the FBI analyze their hacked servers! There was no indication, nor evidence that voting machines were tampered with either. There are still no smoking guns proving Russia handed the election to Trump only claims they "influenced" the election. Those in power on the left are in fact suggesting millions of people were on the fence as to who to vote for up until the Podesta and DNC emails were leaked which was enough to swing an election. The countless videos of Trump rallies with thousands if not tens of thousands in attendance vs few hundred or thousand(s) at Hillary rallies are dismissed. Their polls said she would win, polls which were proven to be total trash that probably covered blue states over red. Did Russia make Hillary have a private server that the FB was investigating? Did Russia make Anthony Weiner engage in sexting with minors which resulted in his devices being confiscated and analyzed to show there was info that was not handed over? Where is the proof that Russia handed the election to Trump? If Russia had so much influence on the election then why did Hillary W I N the popular vote by 2.87m votes!? Who did Putin influence to vote for Trump if she got more votes!? Democrats, including celebs, parade around daily arguing "the majority spoke", declaring she won! Ok fine in this context yea she did, she got more votes which means there was NO influence on the voters. That said this issue and whining about Russia's involvement is over. It's only because of Hillary's arrogance and dependence on the media to protect here while ignoring the flyover nation she lost the electoral college. 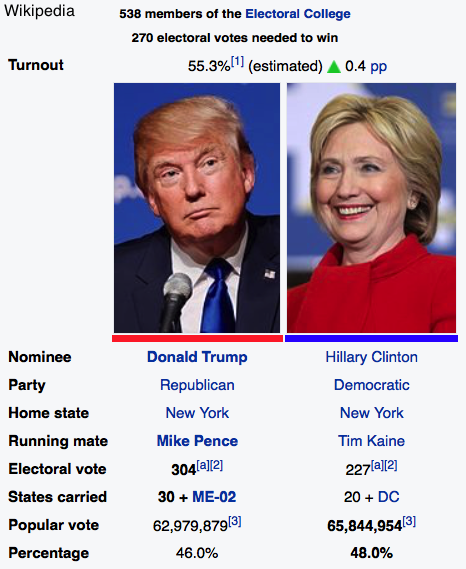 Had Trump won the electoral AND popular vote, maybe democrats would have something to stand on. But facts are facts, people came out to vote, she was a horrible candidate who was running on more or less being obama's third term. I've listed a long list of reasons why she lost that dems refuse to accept. They want to hang on to this Russian boogeyman, they can, but from now on when dems whine about Russia swinging the election point out her popular vote win!